Whether you’re a child or an adult, you’re sure to love masks. From their simplicity and versatility, to their colors, unique design, and ease to create – you just can’t go wrong! Below we’ve gathered 30 terrific DIY paper mask tutorials which we know you’re going to love. From impressive cardboard masterpieces to simple masks you can make using paper plates – it’s all in here. It’s time to gather your scissors, glue, paints and paper before diving into the following fun tutorials! It’s quite amazing what you can do with some paper templates, glue, and paint! All For The Boys will show you how this fancy helmet mask was created. Next time you’re searching high and low for eye-catching masquerade attire, embrace this tutorial from Cut Out and Keep instead! Old book pages are turned into this extravagant mask thanks to this DIY tutorial. 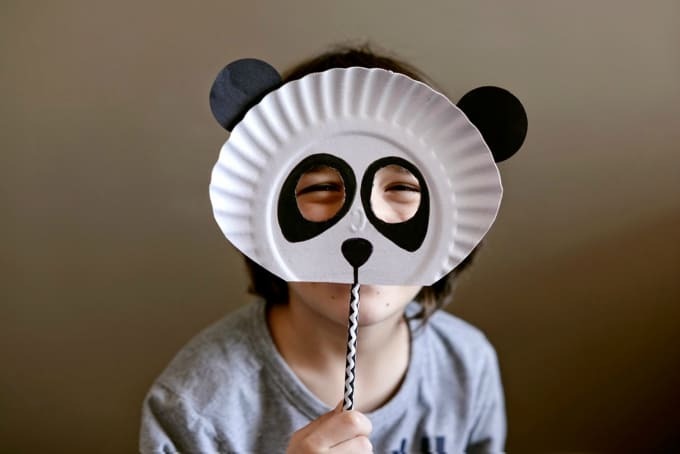 Did you know that you can easily transform paper plates into unique animal masks, just as Estefi Machado has done? Children are going to love working on this creation! These masks from Handmade Charlotte are perfect for creating as last-minute costume options! Not only do they use everyday materials such as cardboard and paint, but they’re also incredibly simple to make. 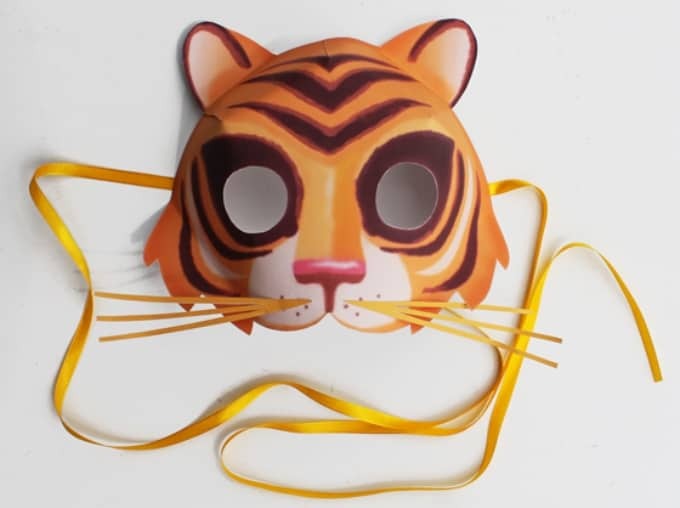 This tiger mask from Happy Thought looks incredibly professional, but how would you feel if we told you that you can download the template for free, cut it out and create it yourself all within a matter of minutes? Genius indeed. 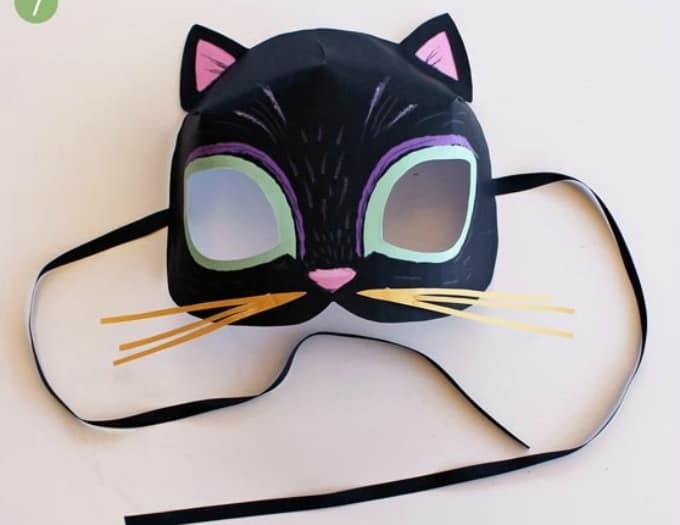 This black cat mask from Happy Thought is perfect to wear to any fancy dress occasion, whether it be a kid’s birthday party or Halloween. You’ll love the simple step-by-step tutorial too. Day of the Dead skull masks needn’t be expensive or tricky to make (forget papier mâché!). Happy Thought has actually created a super simple downloadable template for people to print, cut out, and glue together! Who doesn’t love cute and cuddly pandas? Happy Thought has added another DIY paper mask tutorial to her series, this time featuring the much-loved animal. Stuck for a Halloween costume idea? Why not dress as a Mexican wrestler? Happy Thought’s free downloadable paper mask template already has half of the costume covered! This DIY paper mask idea is so easy, that even your children can take full reign of the project! I Heart Crafty Things’ fun tutorial to create this superhero mask will put a smile on everyone’s face. Isn’t this paper tiger mask stunning? There’s a whole array of ideas just like this one via Instructables, so you’re sure to find inspiration and motivation on this site. These child-friendly paper masks from La Maison de Loulou are so wonderful that you will want to turn them into wall hangings once your kids have finished playing with them! They’re so easy to create too thanks to this video tutorial via Parents.com. What child doesn’t want to be Batman? Laura’s Crafty Life has a great tutorial to help you create this Batman mask in just minutes – it’s that simple! Christmas is just around the corner, so here’s another great DIY to celebrate the festive season – by creating a Nutcracker mask using paper and cardboard! Llevo el Invierno will show you how it’s done. This terrific T-Rex full mask was made using a simple cardboard base, so it’s not nearly as tricky as it looks! You’ll get some inspiration for re-creating this masterpiece via Make Zine. If you prefer step-by-step visual instructions, then you’re going to love this video tutorial from Make Zine teaching you how to create this beautiful bird-inspired mask. This owl mask is too wonderful not to make, so you’ll be glad to hear that Marie Claire Idées has the full tutorial to help you recreate it. What a hoot! Meaningful Mama has created not one, but five DIY superhero masks using the humble paper plate! The best bit is that kids can create these with little to no help, and they will be entertained for hours on end. 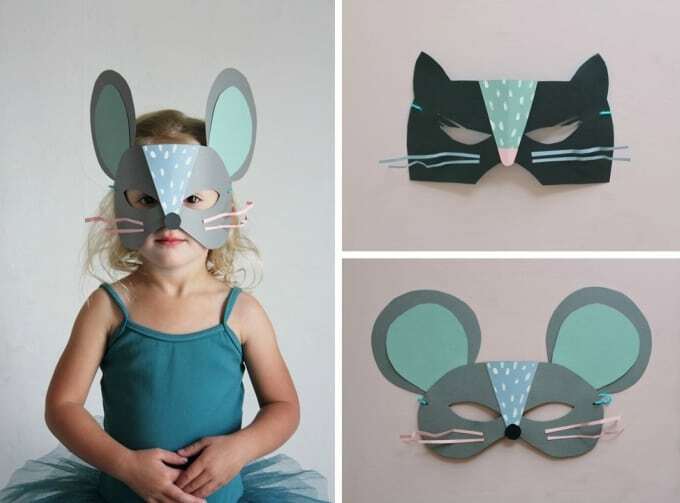 These cat and mouse masks made entirely from paper are adorable! Mer Mag will provide you with all of the inspiration you need to re-create these mini works of art. Mr Printables has been kind enough to offer all of these wonderful DIY Halloween mask templates – isn’t that wonderful? Now you’ll be spoilt for choice next time Halloween swings by. 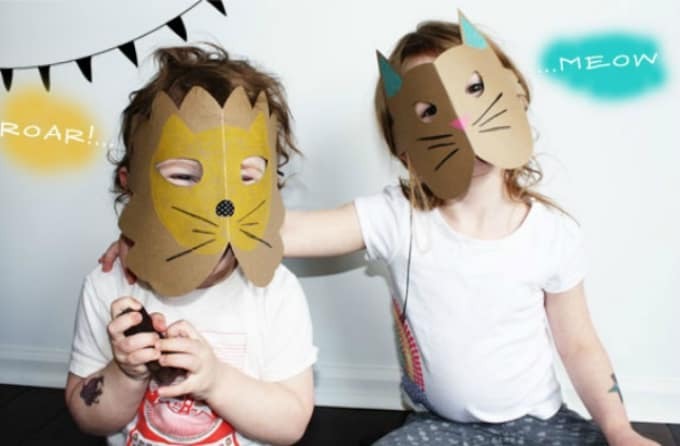 Featuring an owl design and a fox design, these DIY cardboard animal masks from Project Nursery are sure to wow even the toughest of critics. These are also the perfect craft projects to tackle this weekend. These masks from Spearmint Baby are perfect for beginners to create because all you need to do is fold a piece of cardboard or paper in half and cut – Too easy! These paper mask designs from Ta. Ta. Kids Design are absolutely stunning – The combination of colors and shapes are just perfect! While there isn’t a full tutorial for creating these designs, this blog will inspire you to re-create these designs yourself. These animal masks from The House That Lars Built use layers of cardboard to create a 3D effect. You can then leave the cardboard plain, paint it, or even glue beautiful fabric on it for a unique look. Just by looking at this wonderful photo from Redbook you can see which shapes or templates you would need to whip-up in order to re-create these fun masks. Tip: the more color, the better! Who knew paper bags could be so much fun? Wee Society have some lovely free templates that you can print and glue onto this kitchen staple to create fun masks for your children. Use layers and layers of colorful paper to create this pretty mask from What the Craft. This tutorial even showcases a few varieties of this design for you to play around with. This tutorial from WikiHow teaches you how to take a mould of your face using tin foil. You can then strengthen the project by using some cardboard or paper, or simply tie string to it ready to wear! While these incredible masks are DIY, you will need to first purchase the template from the very talented Wintercroft on Etsy. These masks have captured the attention of craft lovers around the world, so why not jump on the bandwagon? 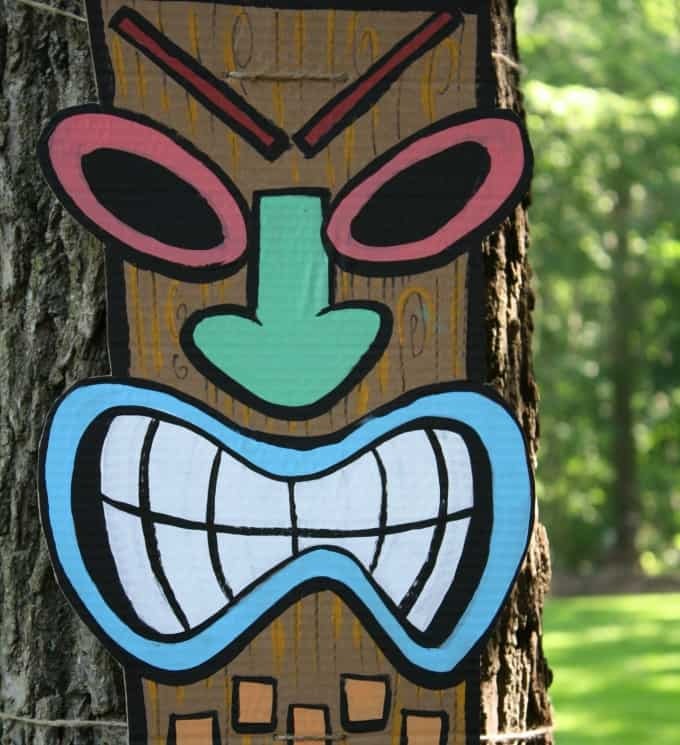 Zween used these cardboard tiki inspired faces as party decorations, but you can just as easily turn them into fun masks by cutting some holes for seeing! They were also incredibly easy to make using cardboard and paint. There you have it – 30 inspirational and unique masks you can easily create from paper sources. Which projects are your favorites? We’d love to hear your thoughts in the comments section below!